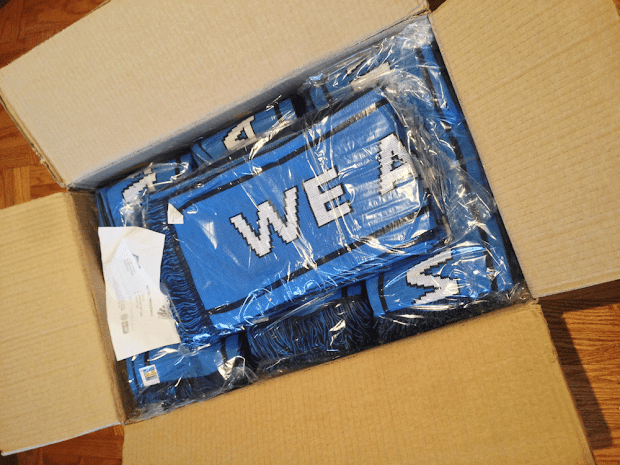 I'll tell you what's in the box: scarves! What's a soccer fan without a scarf? And we have some beauties. 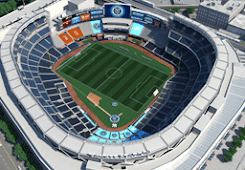 Ready to proclaim that New York only has one MLS club, and that club is True Blue. 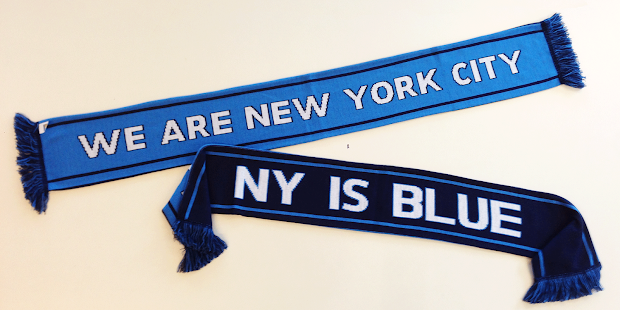 These are the first NYCFC scarves available anywhere. And only the second piece of merchandise commercially available anywhere. So how do you get one, you ask? I'm glad you did. This limited run will be available exclusively at the first organizational Supporters' Group meeting this Saturday at noon, at the Football Factory in Legends Bar. If we have any remaining after this meeting, we'll make them available online. But no guarantees. 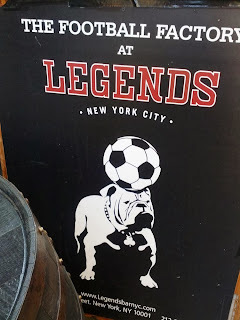 The scarves were manufactured by Sports Scarf, and feature sky blue on one side, navy on the reverse, with two slogans claiming the city is ours. Perfect for holding up in unison when those Jersey Boys come to visit the big city. 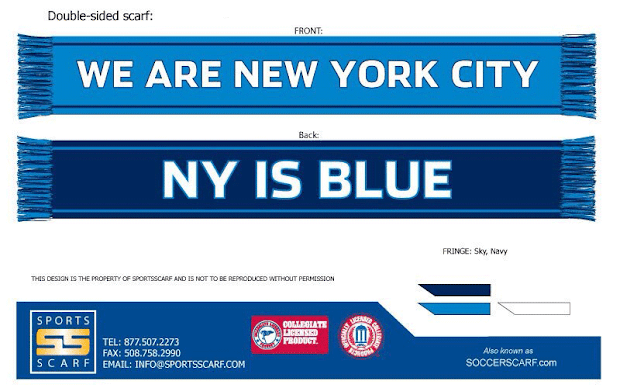 There will be more scarves available later. Different scarves, from the club itself and from the supporters' group once it has a name and logo. But there will ever only be one first scarf. For those of us who have been fans since Day One, that means something. And it will mean so much more when we wear them to that first match in 2015. Don't miss out on this very limited run. I'll see you at the Football Factory. I need to purchase one of these scarves in the UK PPPPLLLEEEAAASSSEEE ! "WE ARE NEW YORK CITY"